I’ve been in the field of Natural Medicine for almost 30 years and at the end of September (2017) we made the decision to move from the Edmonton area of Alberta to the quaintly eclectic Village of Canal Flats in British Columbia. This has turned out to be one of the best decisions we’ve ever made and I absolutely love it here! Nothing screams creativity like living smack in the middle of one of the most beautiful valleys in Canada (and possibly the world!). We are literally surrounded by mountains and lakes and trees and wild-life. 90% retired from the Natural Health field, I’ve shifted my focus to developing and nurturing my artistic skills and have fully immersed myself into creative mixed media art, photography, and music (I’m a co-songwriter and drummer at BoRuza Music … some of our songs are posted at http://www.boruzamusic.com if you’re interested). I’m also one of the resident artists at Kootenay Kool Gallery and Studio here in Canal Flats. We’ve brought tie-dye back into the Valley and have a huge selection of articles – ranging from casual wear to high end to hoodies and sweat-shirts. Over the last few years, I’ve been working on reconnecting with my Creative Self via process painting, journaling, andcreative journaling. Creative journaling has opened up a whole new world of wow for me, and has helped me to connect with my authentic Self on a deeper, more conscious level. Plus, it’s so much fun! Who knew that combining artsy-fartsy creative stuff with journaling could be so satisfying to my Spirit. It truly has been a blessing in my life: I feel more free, more connected, more open, and much more happier than I have in ages. 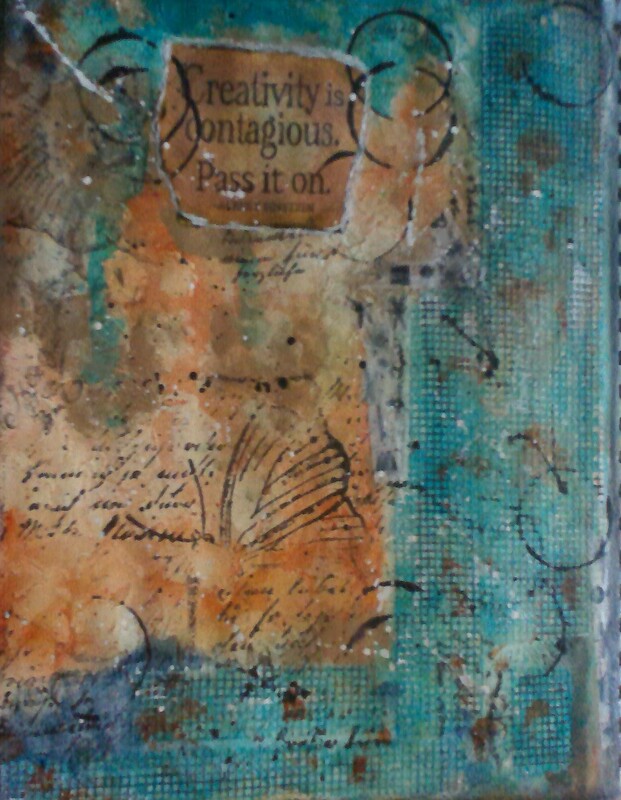 Just before we moved, I had collaborated with a dear artist friend of mine, Jean E. Tait, and together we shared the “how to’s” of Creative Journaling via workshops. I don’t know what the future holds regarding further workshops, and I’m not sure where Creative Journaling will take me; for now I just want to share what I have created. My intention for doing this is to hopefully inspire you to go out and create and get happy too! This site/blog is all about my creative journey – whether it be through mixed media, crafting, or photography. I cycle through things according to what my Spirit needs and as with my journaling, I simply want to share in order to inspire. If you’d like to stay on top of things that happen around here, please subscribe via email (link in right menu) or, if you’re already a WordPress member, you can click on the “follow me” icon at the bottom of the page. Emails from me are rather infrequent; maybe 2-3 times a month (sometimes a tad more, sometimes less) and if you do follow my blog, you’ll get the updates that way.